Most fertility issues are treated with drugs or surgery, while fewer than 3 percent require more advanced techniques such as in vitro fertilization (IVF). But the most important thing you’ve probably uncovered is that infertility doesn’t discriminate. While it impacts people across gender, race and socio-economic class, access to treatment is even more difficult for those who lack insurance coverage or the economic means to pay for care out-of-pocket. Share your story. Infertility can be an intensely personal journey. 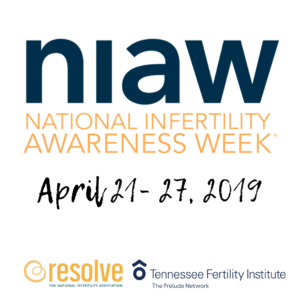 Even so, some well-known figures like Michelle Obama and others and have stepped forward to share their own stories and encourage others who might be struggling through infertility treatment. Sharing your story might be helpful to you, too. Would you be willing to share your story with us, so we can share it with others who need encouragement? Click here if you are. You can also advocate and raise awareness on social media using these tips and tools provided by Resolve. Advocate with your employer. While more and more employers are discovering the value of adding infertility benefits to their offerings, many don’t. Plan a time to talk with leaders within your organization about the importance and value of adding these types of benefits. You’ll find tips for having that conversation with your employer here. Support the work of Resolve or another infertility advocacy group you trust. Advocacy groups help raise awareness, organize and advocate all year long. If you find that work valuable, lend your support by donating yourself or hosting a fundraiser.